The 4th and 5th graders had an amazing trip on March 8th! They were able to do many different activities had a wonderful time learning about the history of the area. Their first stop was to the Legislative Building. 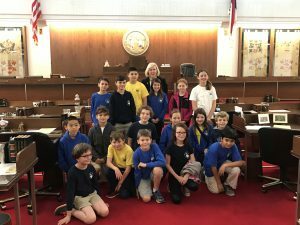 They had the incredible honor of being allowed on the Floor of the Legislative building and saw first hand the view that the representatives get. This is an incredibly unique opportunity as very few people are permitted on the Floor. One of our students’ grandmother’s is a representative and she was able to share how special our students are and how they are such a great group of kids. Because of this, they were able to go on the Floor and did an amazing job of being respectful and courteous throughout our visit. They were also particularly excited to see their names on all of the screens throughout the building! Next, they visited both the NC Museum of Natural Sciences and the NC Museum of History. These were both great experiences where the students saw many exhibits. Finally, the trip ended with a tour of the Capital building. It was interesting to compare the two buildings they had seen that day and to further learn about the settings. Who knows? Perhaps one day, one of our students will return to that Legislative Building as a Representative for our Great State. Click here for pictures of this exciting trip!